Rather than random shoots, specific photography projects are a good way to improve photographic skills. The projects may be self-designed or ones that are requested by clients. Two of my recent projects included shoots for an advertising piece and a bridal show. This is one of the photos used for the advertising piece for The Artful Table, an annual fund-raising event by the Telfair Academy Guild to benefit the Telfair Museums. 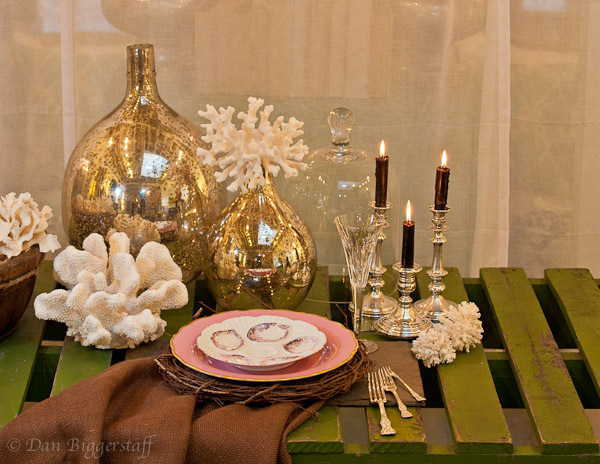 The table setting was put together by a stylist and a graphics designer. The main light source for the shoot was a skylight; the reflection can be seen in the jars on the table but was felt not to be objectionable in the final piece. An off-camera flash with a snoot was used to highlight the plates in the center of the photo. The table in the photo was about 4 feet high, so the photo had to be taken from a ladder at a height of about 8 feet. The reflection of the photographer and ladder in the jars were removed in post-processing. This is the poster used in the ad campaign. The photograph was also used for individual invitations, a banner displayed outside the museum, and a newspaper ad. 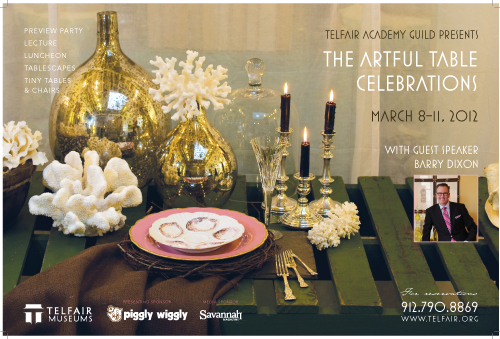 The Artful Table is an annual fund-raising event by the Telfair Academy Guild to benefit the Telfair Museums. The event includes nationally-known speakers, a luncheon, a preview party with foods from outstanding local restaurants and caterers, a silent auction, and table vignettes. Each year the themed vignettes are created by local individuals and businesses with this year’s theme being Celebrations. The second project was a bridal show called Behind the Veil. Monica McMasters and B Street Salon were responsible for the models’ hair at the show. Monica asked if I would photograph the annual bridal show that is held at the Jepson Art Museum. Bleu Belle Bridal provided the models and gowns, and Savannah Magazine is a co-sponsor. Most of the photos were taken “on the fly.” They were all shot using available light with some off-camera fill flash. This provides challenges including poses, background and lighting. When photographing this or a similar event in the future, I will bring additional equipment. A backdrop and studio lighting will provide greater diversity in the photos I can shoot. You can see additional photos from this shoot under EVENTS. This entry was posted in Commercial, Fashion by admin. Bookmark the permalink.